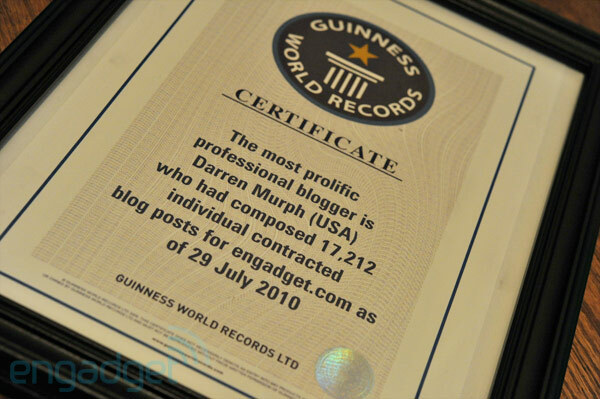 According to Engadget, the publication’s own Darren Murph – who is obviously the blog’s most frequent writer – has been awarded the first ever Guinness World Record for “most prolific professional blogger” for composing a total of 17,212 posts as of July 29, 2010, which works out to about 11-12 posts per day over four years, assuming Murph wrote every day (which we’re guessing he did). This got us thinking – will Guinness now start giving out plaques for all kinds of social media? Most tweets ever perhaps? That would be much harder record to keep a hold of than Murph’s most likely, but we’ll reach out to Guinness to see what other social media records are currently held and/or if they have other ones in mind. The most widespread social networking message was #beatcancer, created by Everywhere and posted 209,771 times on Twitter by different individuals within 24 hours of its first appearance on 17 October 2009.